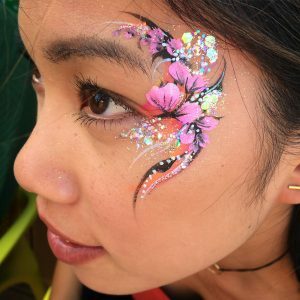 For a glamorous, ice breaking, magical addition to your special day, creative face paint and glitter make up is wildly popular, photogenic and takes your dance floor to an extraordinary level of glam! We can either embellish your evening party, or we can occupy the children during the daytime, keep them entertained during the speeches and then entertain your guests at their tables. You can also extend your booking later into the evening if there’s demand. The services includes all the glamorous extras: festival glitters, sequins, gems, feathers, metallic (gold/silver/copper) leaf, UV reactive paints, plus special glitters for hair and beards. See our portfolio for more wedding pictures or book straight in!